There are not many things I recommend as far as gym gear goes. However, there is one key thing that every weightlifter needs in their arsenal of supplies. That my friends is a solid belt for weighted dips and pull-ups. I will give you the full rundown on the Harbinger PolyPro Dip Belt that I use almost every single day and hopefully you will have a better idea of whether or not it’s worth the investment. There will come a time in every serious lifter’s life that they can push or pull far more weight than what they have naturally attached to their body. This creates the need for a dip belt, vest, ankle weights, etc. I’m a huge proponent of keeping things simple. There is a wide variety of options out there when it comes to adding weight to your workouts, but I personally prefer the belt. There are some key criteria when it comes to choosing a belt that I use, and I will discuss how the Harbinger PolyPro Dip Belt meets all of these expectations. Durability is by far the most important aspect of any gym equipment you are purchasing. You never want to invest in something that will only last you a couple months and break. That’s why I go after products that are proven to last. I have stated the same before with regards gym shoes, nutritional blenders, gym chalk, and really anything else I have reviewed. It’s important! I have had mine for around a year and a half now and it’s in the best shape imaginable. I use it literally almost every day and have zero issues with the chain breaking, fabric wearing out, or anything along those lines. Some other belts are not woven with the same method that the Harbinger manufacturers use and I’ve seen them with frayed edges, ripping, or broken and repaired chains. The polypropylene tensile strength (strength that it has to resist tearing or shear forces which are in abundance when you hang a ton of weight from them) is pretty high at around 36MPa if you care, making this the ideal material for something that will be heavily stressed. In addition to being able to withstand tearing, the chain on this thing doesn’t break. The biggest trouble I could see you having is with the carabinar (the thing that connects back to the chain after you loop it through your weights). If this were to break, however, it is a quick $1-2 fix at your local hardware store or outdoor store that has any sort of climbing gear. I personally have never broken one myself, but I could see how it’s possible. It’s really no reason to scrap the belt completely though. If your looking for durability I would say that this belt is the go to for you. In the gym I am looking for convenience. The last thing you need to worry about is trying to rig something up that is extremely complicated. There are options out there with screw shut links for the chain portion of the belt or even worse, velcro. Yeah, I don’t have any idea who would trust velcro to hold up 90-135 pounds 4 feet off the ground either. Is The Harbinger PolyPro Convenient? The convenience of the Harbinger PolyPro Dip Belt is second to none. You slide the chain through the alternate side of the belt, go through the middle of your weights and hook it back to the chain using the carabiner. It really doesn’t get any more simple than that, folks. Packing it away and toting it around is easy as well. Sometimes weighted items with large, bulky shapes can force you into carrying a larger gym bag, but if you are a backpack person like me you will likely be going for easy transportation. The PolyPro, over the leather options out there, is very malleable and comfortable so it’s easy to fold up and throw in your bag without breaking down the material too badly. It’s important that I can use this belt for pullups, dips or anything else that I may need to attach weight to myself for. Quite often I’ve seen weighted vests that work for really any application, but they are lacking the ability to go extremely heavy. I know there are many people out there that need much more than lighter weighted vests can offer, and while vests usually have the option to pack them full of more weight or remove weight as needed, I prefer them for running and pushups only. Many vests out there max out at around 110 lbs and I know there are some occasions where I’ve seen people using 135. If you outgrow the maximum weight of your vest you end up paying more for an additional vest that turns out to be unnecessary. With a dip belt, you can choose to add or remove as much weight as you need and not worry about losing that weight since you are using the plates provided by your local gym. Really these two items just are to be used for different purposes. Oh the big dollar signs. Belts are cheap. You can snag a Harbinger PolyPro Dip Belt for under 30 bucks especially if you have Amazon Prime and free shipping. There are belts out there for slightly cheaper, and there are leather belts out there that are more expensive. However, for the price, the Harbinger is without a doubt the best constructed. Personally my $30 has paid off time and time again as this belt allows me to get in a full workout without worrying about the chain breaking, fabric ripping, or adding or pulling off weight in a timely manner. Would I suggest the Harbinger PolyPro? Most definitely. Like I said in the beginning I am not huge on suggesting things, but if it’s a quality product that will last a significant amount of time and it is a must-have for the gym, then I hope to be able to help guide people down the right path. It’s a low cost solution that can last you for years. You can buy it at most of the main chain gyms, a sporting goods store, or you can click the banner below to buy on Amazon. If you do buy it and you hate me because you don’t like it, feel free to come back to this article and yell about it in the comments. I have thick skin, I can handle it. Overall I would rate it an easy 4.5/5 which is pretty consistent with it’s rating on any vendor sites out there. This seems to be a very good quality dip belt and a very reasonable price. I think it is for sure. If you do snag it and end up liking it let me know! This sounds like a great belt especially the price. The durability you speak about is awesome. If you frequent the gym a lot it has to be tough. Please keep us up on any equipment you deem fit to purchase. Thanks. Thanks for reading. You definitely can’t beat the price for the quality of this belt. Being in the gym almost every day can really take a toll on equipment so it’s important to get the right stuff. I’ll definitely keep you up to date on the most quality stuff I find! Fitness is a major concern for people around the world. I think I like belts because they can be used for different types of exercises. The harbinger polypro dip belt is especially recommended because of its durability, convenience of use and pocket friendliness. It most definitely is. The Harbinger is especially versatile and can be used for a few of my favorite exercises. Personal favorites definitely include weighted pull ups and weighted dips! Glad you have had a positive experience with this belt also. Let me know if you have any questions and thanks for reading! For every person looking to build up their bodies there definitely would come a time when they would need to carry things like this. I see why this belt is better than others. The manufacturers sure knew what they were doing when they created this. The HARBINGER POLYPRO DIP BELT is a must have and from what I see it would be really convenient to use. I 100 percent agree. My gym bag is starting to get a bit excessive though will all of the different gear I’m toting around. It probably doesn’t help that my gym chalk goes everywhere inside the bag also! I do agree, they hit the happy medium perfect with the different features they offer. Thank you very much for sharing with us such an important blog. If I did not read this blog I can not find the details about your “HARBINGER POLYPRO DIP BELT”. This blog will be very much helpful to the others who want to get benefits of it. The most interesting thing I basically gain from here is this belt will help us to get more weight. That is very helpful to us. I will definitely share this blog with my friends. That is true. You can add weight to the belt using the chain and carabiner. This allows you to perform weighted exercises that are typically body weight limited. This helps when you are easily performing high rep sets and no longer being challenged by a workout. I personally use it to reduce rep ranges and target more of a power-style workout over something that is geared toward hypertrophy. Let me know if you have any questions about this dip belt or other general Harbinger products! I wanted to tell you both that belt for excercising looks awesome. I really don’t get to the gym enough. When I was going I really liked it and I felt good and had more energy. I don’t go much because I had a stroke back in 2012and I deal with Ciattica on my left side. It gets so painful sometimes I just need to rest. let me get back to topic. That belt looks very helpful with waste and upper body along with core.It looks like it could be an overall good tool to use in the gym. The cost of it was surprising. I look forward to seeing what you will be doing next. Keep it up there is such a big need for fitness. First, thank you for reading this review! Glad you have found it useful. I totally understand having extenuating circumstances that can keep you out of the gym. Your experience is unfortunate, I look forward to hearing about your full recover and hopefully the ability to one day be able to get to the gym and get that overall energy level back. It really is a great tool. You can’t beat the price either! Hopefully it works out for you. Hey there! Glad you enjoyed reading my review. It definitely does exactly what you need it to in the gym! Bare necessities. Keep in mind this is less for stabilizing the lower back and more for hanging plates or kettle bells. 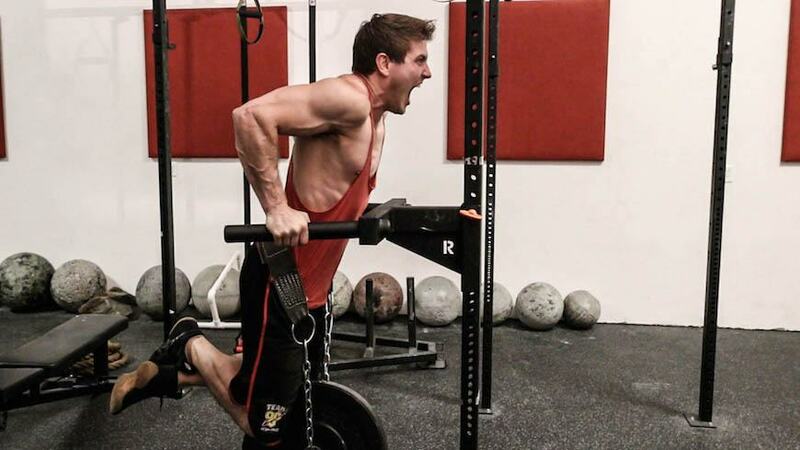 Really, you just want to add weight to an existing workout using this belt. 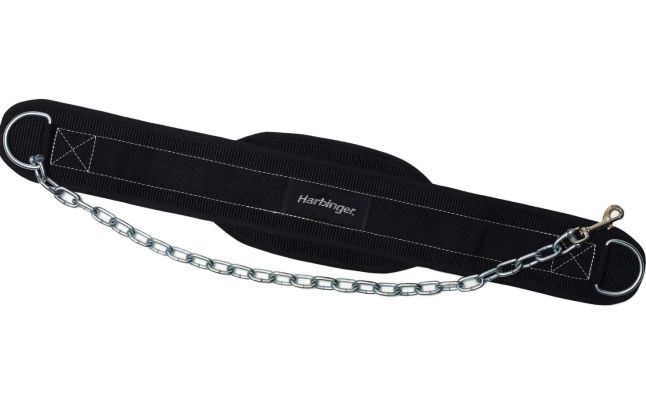 The classic stabilizing belt can also be found on Amazon and Harbinger does have a decent product in that regard as well. I recommend clicking the link above and then chase down the alternative if you’re in the market for a new one. I’ve heard about Harbinger manufacturers before.And it is easy to control the strength and elongation of polypropylene.Maximum customer focus on three things of any product; 1 Easy to use, 2 Durability and 3 Reasonable price. I think Harbinger Polypro Dip Belt have all the three qualitieswhich are mentioned above that makes it a standard product.It is a helpful article for the weightlifter. That’s a very interesting take on their product! I actually did not know that about polypropylene. You must have some sort of expertise in product materials. I appreciate you offering up your insights. I definitely would agree, this belt has all three of the qualities you outlined above which are critical when lifting.